Rescuers plucked Yasin from the Malacca Strait, where he was clinging to planks for dear life. The young Rohingya refugee's sister and parents were not so lucky. "I was told I'm going to America," Yasin says. "I'm going to study there." The trawler’s captain had abandoned the ship and naval authorities in the region had pushed it back out to sea, bereft of fuel and potable water with over 800 refugees and migrants from Myanmar and Bangladesh onboard. With passengers crammed above and below deck in sweltering heat, a deadly brawl over water erupted. As the fight spread above and across the deck, Yasin,* 10, his parents and three siblings – aged three to nine – found themselves caught between passengers slicing crowbars and axes at each other. “We all jumped into the sea to save our lives,” Yasin says. Another man who had jumped helped Yasin onto a couple of wooden planks that had been ripped from the hull, but there was nothing else to keep Yasin’s parents afloat. Their bodies eventually surfaced not far from his five-year-old sister, Begum, who had also drowned. His younger brother Ilias and little sister Gultaz were nowhere to be seen. Yasin was alone and bobbing in the open sea 100 kilometres off the coast of Indonesia. “We all jumped into the sea to save our lives." Over 10 days in May 2015, Indonesian fishermen rescued 1,800 refugees and migrants from three abandoned boats. More than 500 were refugee children, and most of them were alone, unaccompanied by any family members. Yasin was one of them. Around 170,000 refugees and migrants are believed to have attempted the journey between 2012 and 2015; some 2,000 are believed to have perished en route. But when the well-travelled smuggling route was suddenly disrupted by authorities, the smugglers cut their losses. They abandoned Yasin and thousands of others in the Bay of Bengal and Andaman Sea, after no government in the region would allow their boats to disembark. The slight youngster was among hundreds of stateless refugees rescued from the sinking vessel they had boarded from Myanmar hoping to find opportunity in Malaysia that they were denied at home, where restrictions on freedom of movement had made life untenable. “Six of us got on the boat together,” Yasin recalls. The family left Myanmar from their hometown of Sittwe in the western state of Rakhine, where intercommunal violence in 2012 displaced over 140,000 people. About 120,000 remain in camps today, the vast majority of them stateless people. “We always had to hide on the way to school,” Yasin recalls. 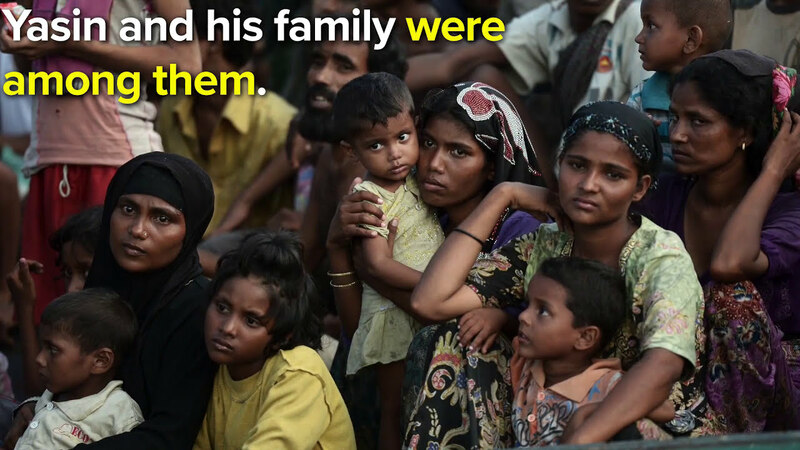 “If we said we were Muslim, they would beat us.” What he cannot yet articulate is how official constraints on the movement of ethnic Rohingya families like his has cut them off from any kind of sustainable livelihood, and given them little choice but to take to sea. “My father promised he would send me to school in a new country,” Yasin said. The family departed in early 2015. Smugglers transferred them from boat to boat until packing them onto the gray fishing trawler, with over 800 people crouched shoulder-to-shoulder on two levels above deck and two levels in the hold below. The captain was a round man who spoke Thai and Burmese, with a shaven head and the tattoo of scorpion stretching across his left bicep. Yasin believed that his parents and three siblings had drowned, but two survived. Not long after Yasin’s family had been transferred to the trawler, the captain set sail towards Malaysia and, from his perch in the cabin one level above the stern, aimed his gun down at a Rohingya man sitting on the deck by the bow. The captain pulled the trigger, and the passenger crumpled over, blood streaming from his head. Some survivors said it was a ritual among the people smugglers, the sacrifice of one to ensure safe voyage for the many. UNHCR, the UN Refugee Agency, registered Ilias and Gultaz in Langsa on May 20, 2015, almost right after they had been rescued. For protection staff, it was hard to forget the story of how their entire family had drowned: their parents, their sister Begum, and, they thought, their brother Yasin. So when UNHCR moved on to Medan to register the next batch of survivors, including Yasin, they quickly recognized the parallels in his story. He sat next to the staff, eyes fixed on their laptop screen as they scrolled through a database of missing family members. His details matched with Ilias and Gultaz, and when staff pulled up their photographs, Yasin looked confused at first. Then he smiled and cried, the first rain after a long drought. UNHCR tried to reunite the siblings, but Medan and Langsa are in different provinces, and there were administrative hurdles to bringing children across provincial lines. As months passed, the wait to be with each other, and for any kind of solution in Indonesia, seemed to go on indefinitely. A thousand Rohingya in Indonesia faced a similar predicament, and in their desperation to see their loved ones and earn a living, some began arranging their own passage to Malaysia. They sought out the only means of travel that has ever been available to them, people smuggling, and once again embarked on a risky, albeit shorter, sea crossing. Just this month, 54 Indonesians died when their boat capsized as they attempted the crossing. “We always had to hide on the way to school." Last month, violence broke out in Rakhine state again. Villages have been burnt down again. People are fleeing again. The misery Yasin has seen in his short lifetime is enough to break even the most resilient adult, and yet when UNHCR staff visited him recently, Yasin was buoyant, unburdened. Not in a detached way, as we might fear for a child wrapped in harrowing memories, but steady and bright, lifted by the prospect of going to school again, like his father had promised. “I was told I’m going to America,” Yasin says. “I’m going to study there.” As a particularly vulnerable refugee with little chance of local integration in Indonesia or legal entry into Malaysia, Yasin has been approved for resettlement to the United States. Ilias and Gultaz, he hopes, will be able to join him. *All refugees’ names have been changed for protection reasons.